Johnson, author of a number of books, on subjects ranging from family humor to brain science, and Randolph, her grown daughter, team up in this quirky memoir with recipes. Johnson, diagnosed with Inattentive ADD, is scatterbrained, sloppy, and disorganized, while Randolph likes her ducks in a row. “Organization was my form of teenage rebellion,” writes Randolph, while her mom admits that during those years, the smoke alarm often served as the dinner bell. Johnson is a self-proclaimed bacon and butter lover; Randolph is vegan. The authors toss anecdotes back and forth throughout the folksy chapters, sharing stories of a loving family in which “hospitality is a way of life.” Between slices of life, the mom-daughter duo offers an eclectic array of recipes (main entrees, sides, appetizers, soups, desserts, etc.) ranging from spicy puttanesca sauce to cashew queso and roasted corn bean salsa (Randolph lives in Texas, while Johnson resides in Colorado). Recognizing that many contemporary families, like theirs, include members with varying dietary preferences and needs, the authors provide instructions on how to alter recipes to please and appease vegetarians, vegans, and the gluten-free. 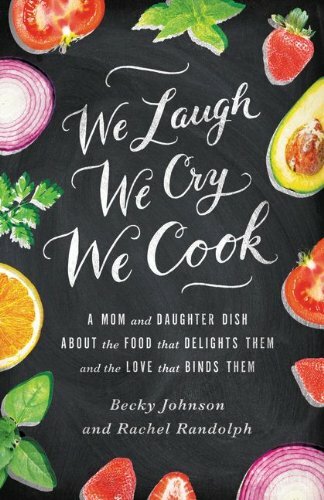 Amusing, endearing, and spiced with a close mother-daughter bond, the authors interweave their humor and cooking advice with sincere gratitude for the blessings of breaking bread with family and friends. (Aug).